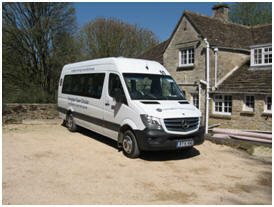 We arrange Trips to local towns and places of interest and to events within easy travelling distance of Faringdon. Weekday afternoon trips plan to allow at least 2 hours at the chosen destination and can be as diverse as visiting a local garden centre, out of town shops or a major historic city. Weekend day trips plan to allow at least 5 hours at the chosen destination and again can be as diverse as visiting a national exhibition or a day at the seaside. Time spent at the destination depends largely on the distance travelled and the published return time. The afternoon trips normally leave the Market Place at 1.15pm and allow 2 hours at the destination, returning home by 6.00pm latest. Please check times when purchasing tickets. The all day trips normally leave the Market Place at 9.00am unless otherwise stated. Please check times when purchasing tickets. Folding wheelchairs can be accommodated but all passengers must be able to access the bus from the pavement and ascend one internal step to the otherwise flat floor. For queries about the trips please call Tourist Information Centre or the FCB Trip Organiser, see Contacts for address and telephone number. If YOU have suggestions where you would like to go in the afternoons or weekends please let us know and we will try to fit them in. Our drivers are all unpaid and give up their own time to drive the Faringdon Community Bus. For more details of trips and tickets please see Contacts. Note that a minimum of 8 passengers is generally required for all trips.